This study of the human sensitivity to glowing cloud hazard in hazard zone (HZ) II and III is based on the fact that the inhabitant in North-West flank sector (the Stabelan village inhabitants) and the sand-miners in Blongkeng river and Putih upstream (Srumbung) did not pay any attention to Merapi Volcano dynamics of 2001 eruption, while the status of volcanic activity goes to ‘alert’. They went on to work as they usually do, whereas the area is the most open area upon the glowing cloud hazard. The question is how is their sensitivity toward the glowing cloud hazard ? This study is aimed to (1) understand the characteristics of Merapi eruption in the 19 and 20 century (2) analyze the physical exposure of each flank sector toward the glowing cloud hazard (3) analyze the inhabitant vulnerability to the glowing cloud hazard in the HZ II and III, and (4) evaluate the inhabitant’ sensitivity to glowing cloud hazard in the HZ II and III. 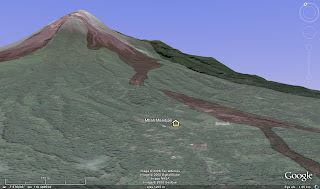 This study is conducted in middle and upper flank, and the peak of Merapi volcano. Historically, these areas have evidently suffered from the glowing cloud. This study uses historical, descriptive as well as explanative approaches. The historical approach is used to analyze the characteristics of the 19 and 20 century eruptions. The descriptive one is used to disclose how the physical exposures and the sensitivity of the inhabitant toward the glowing cloud hazard. The explanative approach is used to answer the question of why are the inhabitant of HZ II and III seemingly insensitive of the glowing cloud hazard. The data will be analyzed by qualitative analysis both including non-parametric statistical (Binominal, Chi-square, Mann-Whitney, Kruskal-Wallis, Cochran, and Sommers’d) and spatial analysis (buffer and overlay). This study shows the fact that there were more eruptions occurred in the 20 century than those did in the 19 century. Although the magnitude became smaller, the disaster more often occurred. This means that the band of social economic tolerance and the damage threshold is narrowing, so that even the small scale eruption (VEI 2) can cause a huge damage (more than 50 deaths). This fact is significantly shown from the decreasing association of the rising of victims and that of eruption’s magnitude; it were 0,913 in the 19 century become 0,434 in the 20 century. Consequently, the inhabitants are more vulnerable to the hazard because they recognize it by recilience approach, so that the tolerance threshold of them toward the hazard is increasing, but their sensitivity toward it decreasing. The result is that the disaster become more frequent. The inhabitant’s sensitivity to glowing cloud hazards is vary; which is reflected in the differences of damage threshold. The broadest damage threshold occurred in the West flank (12 km), and then in the Southern flank (5,5 km), whereas the smallest one occurred in the northern flank (3,5 km). The 7 km glowing cloud is not yet dangerous for the west flank because the residential area beyond the reach of it. The inhabitants instead consider its effect as resources of sand supply. However, if it flows to the other side, to the northern or southern side for example, it will call an extreme and dangerous damage. The eruption activity is dominant to western side (71,05%), and otherwise, the eastern flank is closed to the glowing cloud hazard in the 20 century. 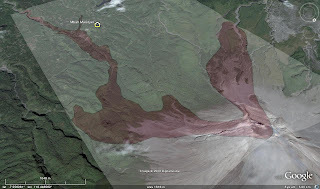 This is because of morphological control which is the setting of shoe shaped nested crater openned to west. Regardless of the morphological control reality, the physical exposure is in fact dynamic, all slope sides are opened with different level of hazard and vulnerability. Disaster happens when the central activity and the active slope are changing, when the inhabitant’s sensitivity to it is decreasing. wah Pak...mksh ngasih info di blog..
emang belajar tu ga hanya di Meja belajar,ato di bangku Kuliah. kita juga perlu media pembelajaran yg ga bosenin. spt dlm dunia maya(internet) ini. Makasih kembali mas -r- setuju belajar memang bisa dimana saja, kapan saja dan dengan siapa saja.. yang penting menyenangkan dan ada nilai tambahnya..
Makasih bikers_sejati.. Amiin.. Semoga blog ini bisa menjadi media pembelajaran di luar kelas.. jadi kapan pun, dan di manapun kita tetap bisa belajar..